During the early days of the Soviet Union, around the time of the Russian Civil War, Mongolia became a contested territory. After being held by the Chinese warlord Xu Shuzheng in 1919, and then by the Russian White Guard General turned independent warlord, Ungern von Sternberg in 1920, Soviet troops with support of Mongolian guerrillas led by Damdin SÃ¼hbaatar, defeated the White warlord and established a new pro-Soviet Mongolian client state, which by 1924 became the People's Republic of Mongolia. In 1921, the Soviet Union began supporting the Kuomintang, and in 1923, the Comintern instructed the Communist Party of China to sign a military treaty with the KMT. But in 1926, KMT leader, Chiang Kai-shek abruptly dismissed his Soviet advisers, and imposed restrictions on CPC participation in the government. By 1927, after the Northern Expedition was concluded, Chiang purged the CPC from the KMT-CPC alliance, resulting in the Chinese Civil War which was to last until 1950, a few months after the People's Republic of China, led by Mao Zedong, was proclaimed. During the war, some Soviet support was given to the CPC, who in 1934 were dealt a crushing blow when the KMT brought an end to the Chinese Soviet Republic, beginning the CPC's Long March from Shaanxi. In 1931, Japan invaded Manchuria and created the puppet state of Manchukuo (1932), which signaled the beginning of the Second Sino-Japanese War. In 1937, a month after the Marco Polo Bridge Incident, the Soviet Union established a non-aggression pact with the Republic of China. During the World War II period, the two countries suffered more losses than any other country, with China (in the Second Sino-Japanese war) losing over 30 million people and the Soviet Union 20 million. On August 8, 1945, three months after Nazi Germany surrendered, and on the week of the American Atomic bombings of Hiroshima and Nagasaki, the Soviet Union launched Operation August Storm, a massive military operation mobilizing 1.5 million soldiers against against one million Kwantung Army troops, the last remaining Japanese military presence. Soviet forces won a decisive victory while the Kwantung suffered massive casualties, with 700,000 having surrendered. The Soviet Union distributed some of the weapons of the captured Kwantung Army to the CPC, who were still battling the KMT in the Chinese Civil War. Between 1946 and 1950, the CPC was increasingly enjoying massive support from the Chinese people in the "War of Liberation," effectively implementing a People's war, while the KMT became increasingly isolated, only belatedly attempting to stem corruption and introduce popular reforms. On October 1, 1949 the People's Republic of China was proclaimed by Mao Zedong, and by May 1950 the Civil War was brought to an end in the Battle of Kuningtou, which saw the KMT expelled from Mainland China but in control of Taiwan. With the creation of the People's Republic of China, the supreme political authority in the two countries became centered in two communist parties, both espousing revolutionary, Marxist-Leninist ideology: the Communist Party of China and the Communist Party of the Soviet Union. In the immediate years after the PRC was proclaimed, the Soviet Union became its closest ally. Soviet design, equipment and skilled labor was set out to help industrialize and modernize the PRC. But the extent of actual support, while not insignificant, fell well bellow Chinese expectations. The Sino- Soviet split was a major diplomatic conflict between the People's Republic of China (PRC) and the Union of Soviet Socialist Republics (USSR), beginning in the late 1950s, reaching a peak in 1969 and continuing in various ways until the late 1980s. It led to a parallel split in the international Communist movement, although it may have had as much to do with Chinese and Soviet national interests as with the two countries' respective communist ideologies. "All people of the world unite, to overthrow American imperialism, to overthrow Soviet revisionism, to overthrow the reactionaries of all nations!" The roots of the split went back to the 1930s, when the Chinese Communists led by Mao Zedong were simultaneously conducting a war of resistance against the Japanese and a civil war against Chiang Kai-Shek's Nationalist Party. 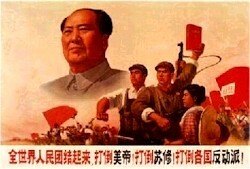 Mao largely ignored advice and instructions from Stalin and the Comintern on how to conduct the revolution in China. Traditional Leninist theory, by this time raised to the level of unquestioned dogma, was based on the revolutionary struggle of the urban working class, a class which barely existed in China. Mao therefore ignored the theory and sought to mobilize the peasantry. During World War II, Stalin urged Mao to form a coalition with Chiang to fight the Japanese. Even after the war Stalin advised Mao not to attempt to seize power, but to negotiate with Chiang; Stalin signed a Treaty of Friendship and Alliance with Chiang in mid-1945. Mao politely accepted all of Stalin's advice and ignored it in practice, driving Chiang off the Chinese mainland and proclaiming the People's Republic in October 1949. Soon after, however, a two-month visit to Moscow by Mao culminated in the Treaty of Friendship and Alliance (1950), which comprised a low-interest Soviet loan of $300m and a 30-year military alliance against Japanese aggression. Meanwhile, Stalin's death in 1953 had created a new situation in the Communist world. Although Mao had ignored Stalin's directives, he had respected Stalin and had acknowledged the Soviet ruler's status as the de facto leader of the Communist movement. When Stalin died, Mao felt that he was now the senior leader, and he became increasingly resentful when the new Soviet leaders, Malenkov and Khrushchev, did not accord him the status he desired. He was mollified by an official visit to China by Khrushchev in 1954, which formalized the return of the naval base of LÃ¼shuen to China, and was also the occasion to agree on closer economic cooperation. Mao did not openly dissent when Khrushchev denounced Stalin with his Secret Speech at the Twentieth Congress of the Communist Party of the Soviet Union in 1956, or when he restored relations with Tito's regime in Yugoslavia, which Stalin had renounced in 1947. But Mao had supported Stalin in many ways, both ideologically and politically, and Khrushchev had dismantled that support in a series of public and private speeches, deliberately rejecting virtually all of Stalin's leadership, announcing the end of the Cominform, and- most troublingly to Mao- also downplaying the core Marxist-Leninist thesis of inevitable armed conflict between capitalism and socialism. Mao was infuriated at these actions, and increasingly felt that the Soviet leadership were retreating from Marxist-Leninism and from the struggle for the worldwide triumph of communism. By 1959, the stage was set for a rupture between the two Communist powers. In 1959, Khrushchev held a summit meeting with United States President Eisenhower. The Soviets were alarmed by the Great Leap Forward, and Khrushchev sought to appease the West. The Soviets reneged on their earlier commitment to help China develop nuclear weapons. They also refused to support China in its border dispute with India, a country moderately friendly to the Soviets. These events greatly offended Mao and the other Chinese Communist leaders. Mao saw Khrushchev as too conciliatory to the West. From the Soviet point of view, however, they were taking prudent measures in light of the existing international situation and the threat of nuclear war. By the late 1950s, both the United States and the Soviet Union had massive nuclear arsenals, and the Soviet leadership was engaged in a strategy that balanced confrontations over issues such as Berlin with negotiations to avoid an outbreak of war. They were not prepared to give Mao nuclear weapons. They also saw the Great Leap Forward as evidence that he was not a real Marxist. The split also arose from Chinese domestic politics. The Great Leap Forward had failed to meet its objectives. For this, Mao's rivals in the Communist Party, Liu Shaoqi and Deng Xiaoping, plotted to remove him from office. The opportunity of a split with the Soviets allowed Mao to portray his rivals as agents of a foreign power, mobilizing Chinese nationalist sentiment behind his leadership. For a time, the polemics between the two parties remained indirect, with the Chinese denouncing Tito and the Soviets denouncing China's ally, Enver Hoxha of Albania, in a war of words by proxy. But in June 1960, the split became public, at the congress of the Romanian Communist Party, when Khrushchev and China's Peng Zhen openly clashed. Khrushchev called Mao a nationalist, an adventurist, and a deviationist. The Chinese called Khrushchev a revisionist and criticized his "patriarchal, arbitrary and tyrannical" behavior. Khrushchev followed his attack by delivering an eighty-page letter to the conference, denouncing China. At a meeting of 81 Communist parties in Moscow in November 1960, the Chinese delegation clashed heatedly with the Soviets and with most of the other party delegations, but eventually a compromise resolution was agreed, preventing a formal rupture. At the twenty-second Congress of the Soviet Party in October 1961, however, disagreement flared again. In December, the Soviet Union severed diplomatic relations with Albania, expanding the dispute from one between parties to one between states. One of the last meetings between Mao and Khrushchev before the Sino-Soviet Split One of the last meetings between Mao and Khrushchev before the Sino-Soviet Split. During 1962, international events caused a final rupture between the Soviet Union and China. Mao criticized Khrushchev for backing down in the Cuban missile crisis ("Khrushchev has moved from adventurism to capitulationism"), to which Khrushchev responded that Mao's policies would lead to a nuclear war. At the same time, the Soviets openly supported India in its brief war with China. These events were followed by formal statements of each side's ideological positions: the Chinese published The Chinese Communist Party's Proposal Concerning the General Line of the International Communist Movement in June 1963. The Soviets responded with Open Letter of the Communist Party of the Soviet Union. This was the last formal communication between the two parties. By 1964, Mao was asserting that there had been a counter-revolution in the Soviet Union, and that capitalism had been restored. Relations between the Chinese Communist Party and the Communist Party of the Soviet Union broke off, as did relations with the Communist parties of the Warsaw Pact countries. There was a brief pause in polemics after the fall of Khrushchev in October 1964. In November, the Chinese Premier, Zhou Enlai, went to Moscow to speak with the new leaders, Leonid Brezhnev and Alexei Kosygin, but he returned to report that the Soviets had no intention of changing their position. Mao denounced "Khrushchevism without Khrushchev" and the war of words went on. 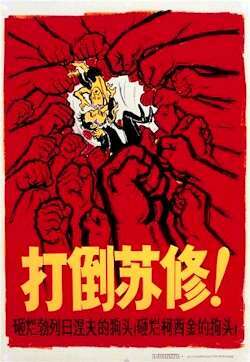 Chinese poster from the first stage of Cultural Revolution, saying: "Topple Soviet revisionists. Smash the dunderheads (dog heads in Chinese) Brezhnev and Kosygin"
After 1965, the Sino-Soviet split was an established fact, and the onset of Mao's Cultural Revolution severed all contact between the two countries, and indeed between mainland China and most of the rest of the world. The only exception to the freeze was Chinese permission for the transport of Soviet arms and supplies across China to support Communist North Vietnam in its conflict against the South and the United States in the Vietnam War. After 1967, the Cultural Revolution overthrew the existing structures of state and party in China. The only significant party apart from the Albanians to support the Chinese line was the Communist Party of Indonesia, which was destroyed during a military coup in 1965. Maoist parties were formed in many countries. The Sino-Soviet confrontation had now become a conflict between states. In January 1967, Red Guards besieged the Soviet Embassy in Beijing. Diplomatic relations were never formally broken, but they went into a deep freeze. The Chinese also chose to raise the issue of the Sino-Soviet border, which was the result of nineteenth century treaties imposed on the weakened Qing Dynasty by Czarist Russia. China did not make specific territorial demands, but insisted that the Soviets acknowledge that the treaties were unjust. The Soviets flatly refused to discuss the issue. In the following year, China reached the depths of the Cultural Revolution, with near civil war in some parts of the country, a situation only partly stabilized in August when Mao ordered the Army to restore order. Thereafter, the worst excesses gradually declined. One reason for this was Mao's realization that China was now strategically isolated and vulnerable. During 1968, the Soviets massively increased their troop deployments along the Chinese border, particularly the border with Xinjiang, where a Turkic separatist movement could easily be fostered. In 1961, the Soviet Union had around twelve half-strength divisions and 200 aircraft on the border; by the end of 1968 there were 25 divisions, 1,200 aircraft and 120 medium-range missiles. Although China had detonated its first nuclear device in 1964 at Lop Nor, its military power could not compare to that of the Soviet Union. Tensions along the border escalated until March 1969, when armed clashes broke out along the Ussuri River on Damansky Island, followed by more in August. Many observers predicted war: veteran American journalist Harrison Salisbury published a book called The Coming War Between Russia and China and, in August 1969, Soviet sources hinted at a strike on Lop Nor with nuclear weapons. But after the 1969 clashes, it appeared that both sides had drawn back from the brink. In September, Kosygin made a secret visit to Beijing and held talks with Zhou Enlai. In October, talks on the border issue were begun. No agreement was reached, but the meetings restored a minimum of diplomatic communication. In July 1971, Henry Kissinger secretly visited Beijing and laid the groundwork for President Richard Nixon's visit to China in February 1972. Although the Soviets were initially furious, they soon held a summit of their own with Nixon, thus creating a triangular relationship between Washington, Beijing, and Moscow. This ended the worst period of confrontation between the Soviet Union and China. In the 1970s, Sino-Soviet rivalry also spread to Africa and the Middle East, where each Communist power supported and funded different parties, movements, and states. This helped fuel the war between Ethiopia and Somalia, the civil wars in Zimbabwe, Angola and Mozambique, and the rivalry between various groups of radical Palestinians. Unlike the Soviets, the Chinese did not actually send troops to any of these trouble spots, but their competitive intervention helped create and maintain instability. The fall from power of Lin Biao in 1971 marked the end of the most radical phase of the Cultural Revolution, and from then until Mao's death in 1976 there was a gradual return to Communist "normality" in China. This ended the state of armed confrontation with the Soviet Union, but did not lead to any thawing in political relations. However, the Soviet military build-up on the Chinese border continued: in 1973, there were almost double the number of Soviet troops present as in 1969. The Chinese continued to denounce "Soviet social imperialism" and accuse the Soviets of being the enemies of the world revolution. This was despite China's cessation of direct support for revolutionary groups in other countries after 1972, and its support in 1973 for a negotiated end to the Vietnam War. This trend accelerated after Mao's death, with the removal from power of the radical "Gang of Four" and the beginning of sweeping economic reforms under Deng Xiaoping, who reversed Mao's policies and began a transition to a market economy in China. By the 1980s, Deng Xiaoping's policies of "seeking truth from facts" and emphasizing the "Chinese road to socialism," which in practice meant the restoration of a market economy in China, meant that China had largely lost interest in Communist polemics, and denunciations of Soviet revisionism took on a fading, ritualist tone. After Mao's death, rivalry between the Soviet Union and China surfaced less in polemics about the internal politics of either country and more in the international field, where the national interests of the two states frequently clashed. The first major confrontation was in Indo-China. The end of the Vietnam War in 1975 left pro-Soviet regimes in power in Vietnam and Laos, and a pro-Chinese regime in Cambodia. The Vietnamese were at first prepared to ignore the murderous domestic policies of the Pol Pot regime in Cambodia, but as it led to persecution of ethnic Vietnamese communities and clashes along the border, they invaded the country in 1978, removing Pol Pot's regime. The Chinese furiously denounced this and launched a "punitive" invasion of northern Vietnam, resulting in the Sino-Vietnamese War. The Soviet Union in turn denounced China, but took no military action. In 1979, the Soviet Union intervened in Afghanistan when the Communist regime there was in danger of being overthrown. The Chinese government, viewing this as part of a Soviet plot to encircle them, formed an alliance with the United States and Pakistan to support the Islamist resistance movements in Afghanistan and thwart the Soviet invasion. This was highly successful; the interminable war in Afghanistan did much to weaken the Soviet system in its later years. China was also involved in secretly supplying aid to the Contras fighting the Soviet-backed Sandinista government in Nicaragua. In 1982, shortly before his death, Leonid Brezhnev delivered a speech in Baku that was somewhat conciliatory toward China. This opened the way for Chinese ministerial representation at his funeral (1982) and low-key efforts at reducing tensions. When Mikhail Gorbachev came to power in the Soviet Union in 1985, he endeavored to restore normal relations with China. Soviet military forces along the border were greatly reduced, normal economic relations were resumed, and the border issue was quietly forgotten. The Soviet withdrawal from Afghanistan removed the major contention between the two states. However, the ideological issues of the 1960s were not resolved, and official relations between the two Communist parties were not resumed. The still frosty relations between the Soviet Union and China prompted many in the United States government under Ronald Reagan to consider China a natural counterbalance against the Soviet Union, resulting in American military aid to the People's Liberation Army. To cement improving relations, Gorbachev visited China in May 1989. An unintended consequence of this summit was the high coverage by foreign media of the Tiananmen Protests of 1989 and the ensuing crackdown. The Chinese government took an ambivalent view of Gorbachev's reform program, which led ultimately to the collapse of the Soviet Union and the end of Communist Party rule in 1991. Since the Chinese government did not officially recognize the Soviet Union as a fellow "socialist state", it had no official opinion on how Gorbachev should reform Soviet socialism. In private, Chinese leadership expressed the opinion that Gorbachev was foolish to embark on political reform before implementing economic reform, whereas Deng Xiaoping had implemented economic reform without weakening Communist Party rule. The collapse of the Soviet Union ended the Sino-Soviet split. Rather than a massive Soviet invasion, the Chinese government was then more concerned about United States intervention in support of Taiwanese independence. Likewise, a weakened Russia was then more concerned about American initiatives such as the expansion of NATO and its intervention in the former Yugoslavia. Rather than a counterbalance against Russia, the United States began to view China as an incipient peer competitor. Due to these factors in the new political landscape of the world, Russia and China tightened relations in order to counter American power. In 1993, the two nations signed a treaty that formally demarcated the border and officially ended all outstanding disputes. In 1996, the Shanghai Five, later renamed the Shanghai Cooperation Organization was established as a loose alliance along with states in Central Asia. The first joint military exercises between the two countries took place in 2005. In 1976, Mao died, and in 1978, the Gang of Four were overthrown by Deng Xiaoping, who was to soon implement pro-market economic reform. With the PRC no longer espousing the anti-revisionist notion of the antagonistic contradiction between classes, relations between the two countries became gradually normalized. In 1979, however, the PRC launched the Sino-Vietnamese War, a failed invasion of Vietnam (a Soviet client state) in response to Vietnam's invasion of Cambodia which overthrew the Dengist government-backed Khmer Rouge from power. Even though Soviet leader Mikhail Gorbachev went on to criticize the post-Maoist CPC when it allowed for PRC millionaires as having lost the socialist path, with the dissolution of the Soviet Union in the late 1980s and early 90s, Russia itself turned to privatization. But unlike in the PRC, this was a much more extreme, highly unregulated form of privatization which resulted in massive losses to foreign speculators, near-anarchical conditions and economic collapse. Thus, in the post-Cold War period, while Russia remained vastly more developed (economically and militarily), in a systemic and deep way (i.e., the PRC in 1949 was less industrialized than Russia in 1914), the PRC emerged in a far more favorable and stable financial position. But whereas the severe Russian shortage of capital was new, Chinese economic and military underdevelopment was not. Nor was the PRC's desperate and ever-growing need for mineral resources, especially petroleum fuel, which Russia holds in abundance in such Asiatic regions as western Siberia.